Meanwhile, in same skillet, heat sugar over high heat 2 to 3 minutes, stirring constantly, until it becomes a golden brown, caramel-flavored syrup. Remove from heat; carefully add 2 1/2 cups chicken broth, stirring constantly (sugar will crystallize). Return to heat. Reduce heat to medium; stir in cherry preserves, wine, cherries, bouillon and salt. Cook 6 to 10 minutes, stirring constantly, until sugar is completely dissolved. In small bowl, mix cornstarch and 3 tablespoons broth until smooth; stir into cherry mixture. Bring to a boil. Reduce heat; cook 2 to 4 minutes, stirring constantly, until sauce thickens. 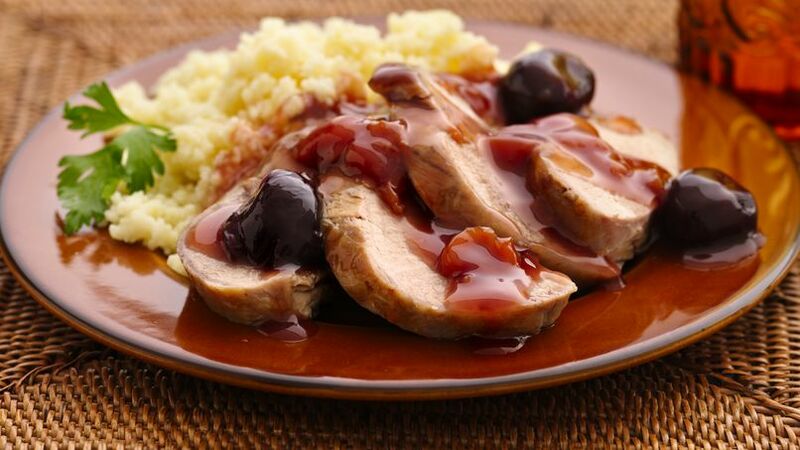 Slice pork; serve with cherry sauce.